Alecia, 4 bedroom Villa with tropical garden, pool and gulf access. Alecia, Palm Tree Retreat, oversized pool area on an oversized canal. The living room features high end leather couches as well as a flat screen TV and a built in wall unit. Villa Alecia featuring an over sized pool deck, with 4 chaise lounges as well as an electrically heated swimming pool. Front elevation of Villa Alecia nestled in mature landscaping. Mature palm trees and exotic plants surround Villa Alecia. Front Entry sitting area. Villa Alecia is located on a triple lot allowing for a large play area on the south side of the home. The eastern facing pool area features sun the majority of the day. Under truss sitting area, 6 chairs and a large dining table. The swimming pool is electrically heated. Sitting and lounging area. Outside dining area offers room for 6-8 guests The formal dining room seats 6 comfortably. Formal Dining View from the main living room out to the lanai and to the breakfast nook which is located next to the kitchen. Living room featuring leather couches, a coffee table and a built in wall unit. View of the living room from the kitchen. Fully equipped kitchen as well as breakfast nook. Kitchen with view to the laundry room which leads out to the garage. View of the kitchen from the laundry room. The guest bedroom with a queen size bed features access to pool area and swimming pool. The twin size bedroom is located behind the kitchen. The guest bathroom features a walk in shower, sink as well as access to the lanai. Bedroom 4 is located towards to the front of the home and features a queen size bed. The master bedroom with its king size bed, little desk as well as TV has access to the side yard and its own little patio. The master bedroom is directly connected to the master bathroom with dual sinks, walk in shower as well as walk in closet. The master bathroom shower features dual sinks and a walk in shower. This very nice 2005 finished Baywood Cape Coral Vacation home is very bright and spacious. The big entryway as well as large living room make this a very comfortable vacation home. The oversized pool area with 150 foot canal ensure fun in the sun as well as privacy. Electric pool heater make it possible to use the pool even in those few cold Florida days. Don't miss out on this great home! It has 4 bedrooms and two good size bathrooms. 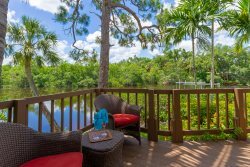 Das vollklimatisierte Cape Coral Ferienhaus Villa Alecia mit 170 m² Wohnfläche wurde Ende 2005 in SW Cape Coral in einem gepflegten Wohnviertel am überbreiten (180') gleichnamigen Kanal errichtet. Das Grundstück verfügt über 40 Meter Wasserfront und hat ein eigenes Bootsdock. Dazwischen liegt das eigentliche Zentrum des Hauses. Eine offene amerikanische Küche mit angrenzender Frühstücksecke, großem behaglichen Wohnbereich und separatem Essbereich. Durch diese Raumaufteilung der Villa kann sich jeder bei Bedarf ungestört zurückziehen. Die große Doppelgarage hat direkten Zugang ins Haus. Für sportliche Aktivitäten stehen 2 Fahrräder bereit. Von allen poolseitig liegenden Räumen ist die Poolterrasse direkt einsehbar und erreichbar. Diese ist nach Südost ausgerichtet und erstreckt sich über die gesamte Hausbreite. So bietet die übergrosse Poolterrasse ausreichend Platz für die ganze Familie, um Sonne oder auch Schatten zu "tanken". Der grosse Pool, 30 ft. x15 ft. kann elektrisch beheizt werden und verspricht so auch bei kühleren Temperaturen Badespass pur. Ein großer Gas-Edelstahlgrill lädt zu einer Grillparty ein. Der gesamte Poolbereich ist mit einem Screen geschützt und teilweise überdacht. Vanessa and Stephan were excellent. She even answered our call on a Sunday. Queen mattresses are not very good. Again, I am appreciative for the helpfulness of the owners and Vestevea addressing a particular problem. MY negatives are with the intent to improve the home not to be critical. The team was helpful and friendly. WE had a good time, enjoyed Alecia and hope to return. Our stay was very nice, the grill is a hazard and should be updated. I am not sure if you are aware but the knobs are not pointing in the correct direction.
. The house was beautiful and our stay was very nice. We had a very relaxing time and would stay here for sure. Our only concern is that the grill was not in good working condition and there are no beach chairs to speak of. I would recommend this home to my friends if ever they were looking for a place in Cape Coral. Der Pool war wirklich super sowie die wirklich gute Betreuung, das Haus selbst, alles war super sauber, es gibt eigentlich nichts was wir bemngeln knnen. Wir waren fr 9 Tage in dem wunderschnen und super sauberen Haus und haben uns sehr wohl gefhlt. Empfangen wurden wir sogar von einer deutsch sprechenden Betreuung. Es hat uns an nichts gefehlt. Wir wrden jederzeit wieder buchen. Great stay in a great house. Only had to contact your office once for the pool and the issue was addressed promptly. Team was great and everyone was very friendly.